How can artists use the Fibonacci sequence of numbers in a composition? Interestingly, the Italian Renaissance mathematician Leonardo Fibonacci (c. 1170–c. 1250) used the expediential growth in a rabbit population to showcase his now famous sequence of numbers often referred to as the Fibonacci Numbers: 0, 1, 1, 2, 3, 5, 8, 13, 21, 34, … (the sequence may be continued by adding the two preceding numbers to arrive at the next which at this point would be 21+34=55). 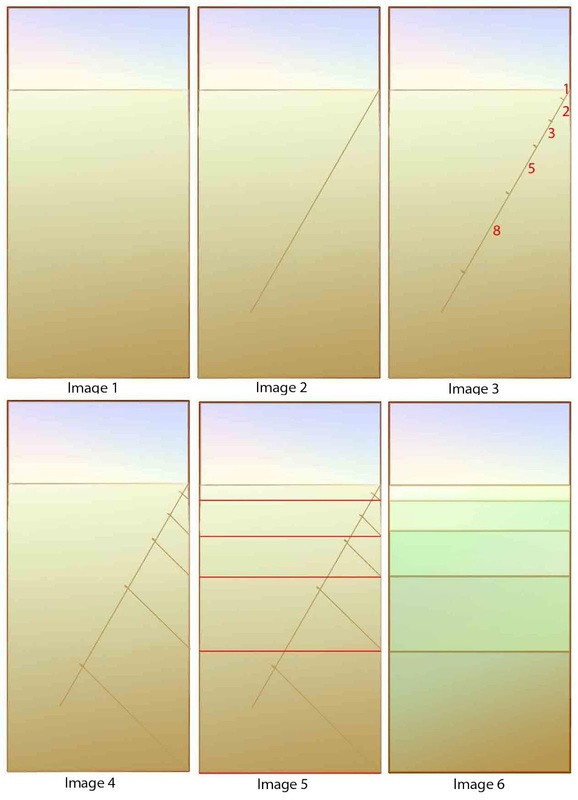 This discussion however moves away from the breeding habits of rabbits by proposing a way that artists can use the sequence to give order and logic to their placement of key features in an image. More specifically, the focus of this discussion is on how the sequence may be employed to create the illusion of spatial depth. 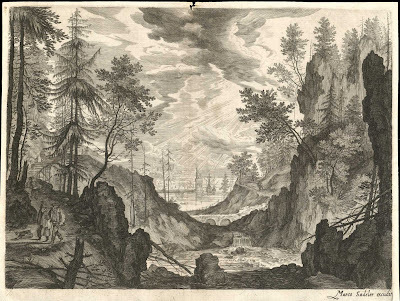 As a practical example of how the Fibonacci numbers assists in giving pictorial depth to an image, I wish to draw attention to Aegidius Sadeler’s darkly moody engraving, Woodland Landscape with a Waterfall (shown below). Here, a view to the far distance along the course of a river framed by cliffs is interrupted by a sequence of rocky ridges acting like stepping-stones for the eye. The space between each of these rocky ridges is where the Fibonacci sequence of numbers plays a role. By measuring and comparing the distance between each of these ridges (see diagram further below) the pattern of spatial intervals becomes apparent: 1 (the spatial zone between the horizon and the first red line), 2, 3, 5, 8. 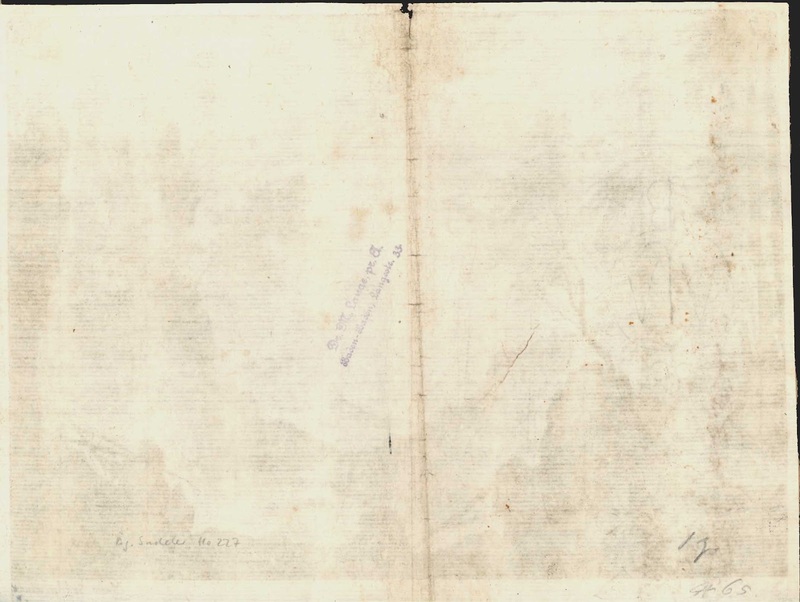 II (of II) with address of Marco Sadeler (lower right) on laid paper from an unknown collection (not at Lugt). Condition: marvellous strong impression. There is a closed tear at top at the dryfold and with a fold along the dryfold. There is also slight foxing but otherwise in good condition. I am selling this print for $430 AUD including postage and handling to anywhere in the world. Please contact me using the email link at the top of the page if you are interested or click the “Buy Now” button below. In Johan Sadeler’s Rocky Landscape (shown below) a similar sequence of spatial intervals can be seen (see diagram further below). 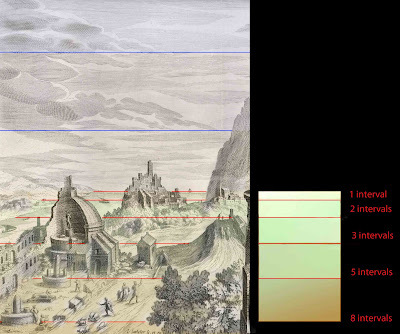 Here, each of the four critical intervals is pictorially marked by a horizontal line with the most distant lines delineating the horizontal aspects of the terrain and the closer lines outlining a band of shadow. Although the placement of these pictorially important lines matches the sequence of the Fibonacci numbers there is a problem with the arrangement of spatial intervals in the sky with regard to eye-catching cloud features (see the same diagram with intervals marked with blue lines). By this I mean that the intervals in the clouds on the left side of the image are almost evenly spaced with virtually no spatial recession, while the intervals in the clouds on the right are larger towards the horizon—a reversal of perspective. From the eighth print in a series engraved by Adriaen Collaert and similar to a composition by Hendrick van Cleve. 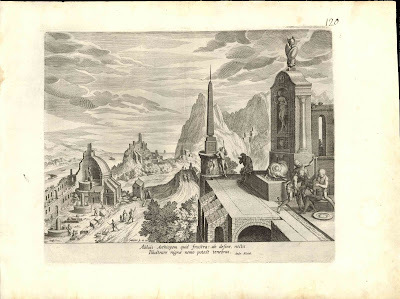 Part of the Emblemata copied after Andrea Alciati (Venice, 1599) (notes from TIB, p. 136). 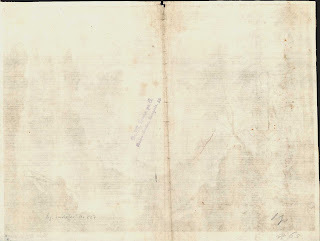 Condition: A dark impression with flattened dryfold and small closed tears with conservator’s tape reinforcing (verso) in the bottom margin far away from the image. An inscription, “120”, is written by an old hand on the upper-right corner outside the plate mark. 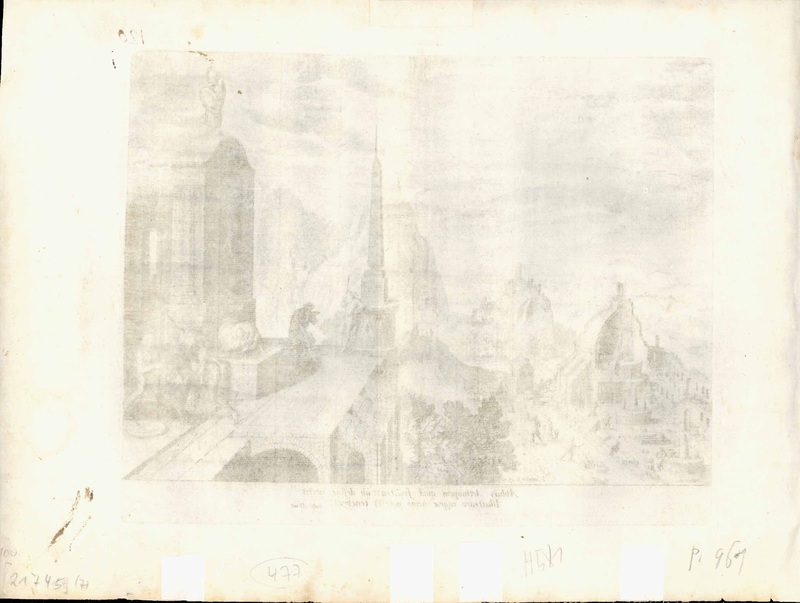 On the back there are pencil inscriptions by previous collectors along the bottom edge and ink smudges 3.5 in length on the lower left otherwise the print is in good clean condition. I am selling this print for $180 AUD including postage and handling to anywhere in the world. Please contact me using the email link at the top of the page if you are interested or click the “Buy Now” button below. An artist’s arrangement of subject matter in a composition to present a regular progression of diminishing spaces is driven undoubtedly by intuition and good judgement. Nevertheless there is very calculated way that can layout the Fibonacci sequence of numbers. First, the horizon line for the composition is established (see first image in the diagram below). Next, an angled line is drawn from where this horizon line meets either the left or right side of the composition (see second image). Along this angled line the sequence of the Fibonacci numbers are then marked out using any unit of measure with the lowest number placed at the horizon (see third image). For example, if the unit of measure were a centimetre then the distance between the first mark away from the horizon and the second mark would be two centimetres and the gap between the second mark and the third would be three centimetres. The next stage is to connect the last mark to the lowest corner of the composition directly below the beginning point on the horizon and to use the angle of this connection as a guide to run parallel lines from all the remaining Fibonacci marks to the same side of the composition (see fourth image). 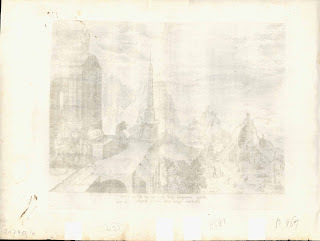 Finally, from the points now established on the side of the composition, horizontal lines are drawn setting the “stepping stones” for the composition’s key features (see fifth image). 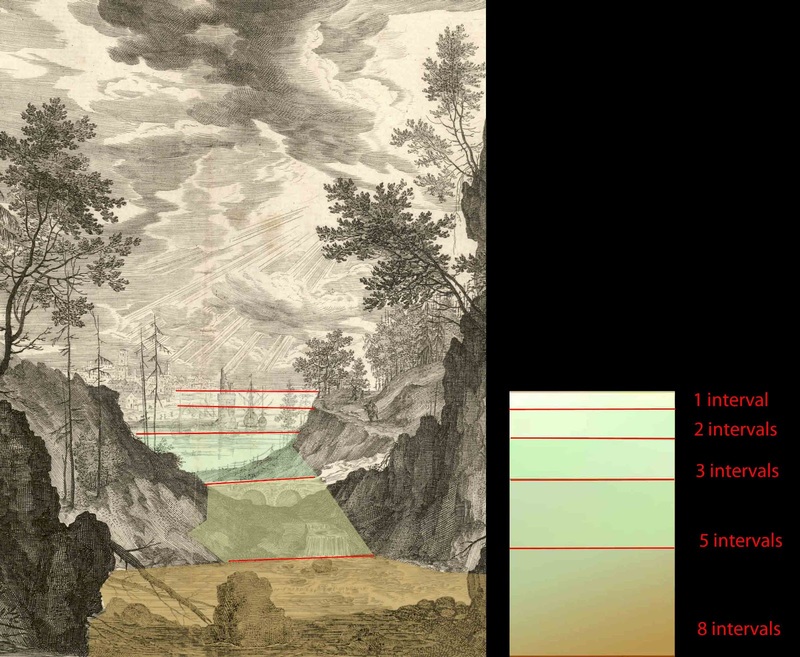 With the disposition of these features now set an artist can then adjust the tonal and colour transitions (see sixth image). 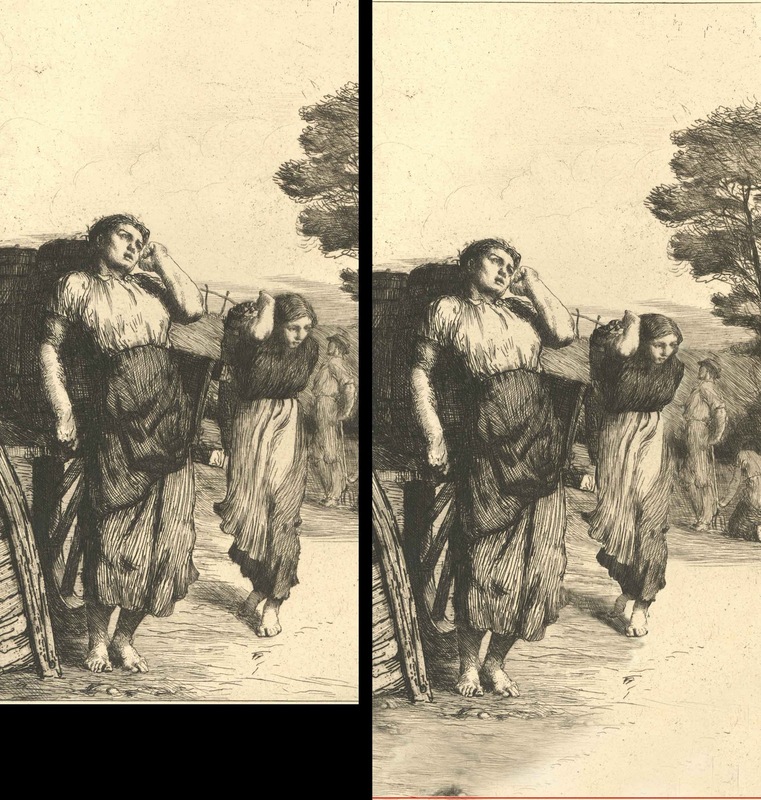 To show the difference to the illusion of spatial depth that Fibonacci spatial intervals can make to an image, compare the two lower images. 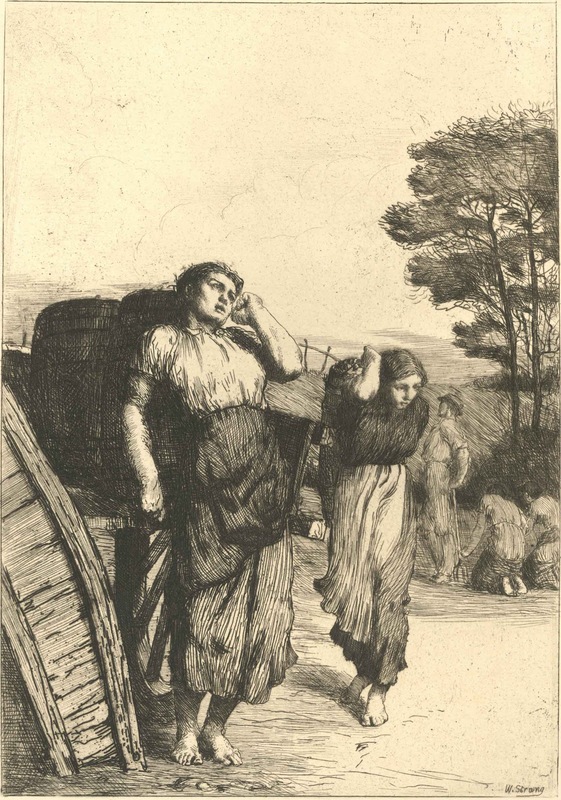 The first image shows a very noble etching by William Strang of women engaged in manual labour. 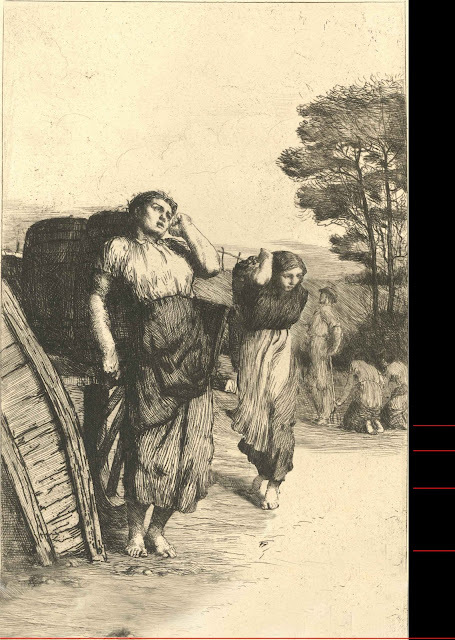 Here, Strang’s arrangement of the two women does not align with the sequence of Fibonacci spatial intervals. In the second image I have altered the arrangement of the women so that their placement on the ground is in accord with the Fibonacci intervals (i.e. there is a larger space in the immediate foreground and the more distant woman is placed further away. I am not proposing that the compositional arrangement of the second (digitally altered) image is better than Strang’s original composition but rather that the second presents a greater degree of spatial depth. Etching on wove paper with The Portfolio MBM watermark.